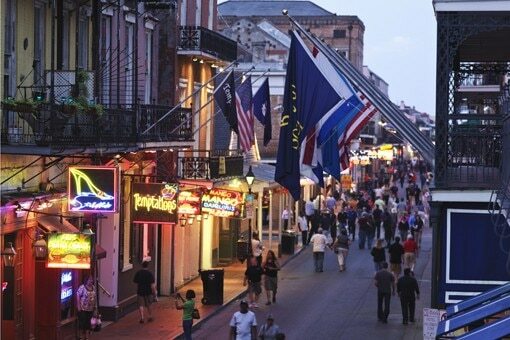 Shopping in New Orleans - much like exploring its bouncing nightlife and head-spinning live music venues - is a truly unique experience, infused with the city’s vintage charm and wonder. Dotted throughout New Orleans you’ll discover tiny family-run antique and jewelry stores, as well as hip independent art sellers. Fashion lovers can enjoy a range of cool retro boutiques and glitzy designer stores, in both the flea markets and the modern malls. A springtime vacation in New Orleans entices visitors with lively music festivals, mild afternoons strolling tree-lined blocks, and cool nights of delicious Creole dinners. Book a spring hotel in New Orleans and immerse yourself in its seasonal pleasures. Elegant townhouses, Victorian mansions and design-rich high-rises – use this guide to the top 10 hotels in New Orleans for a hotel that best fits your style. Choosing where to stay in New Orleans will help make your visit stress-free. Book a room in a New Orleans hotel with this guide to the city’s neighborhoods. You can’t see it all on a short getaway in New Orleans. With only a few nights in a New Orleans hotel, follow our lively itinerary for the best of the Big Easy. Creamy etoufee stew or an icy plate of oysters or spicy gumbo – you can give your taste buds a different treat each night in New Orleans. Get the full experience with this guide to the best eating and drinking in New Orleans.